Depending on your view, Bitcoin is either A) an elaborate Ponzi scheme or B) the currency of the future. Or, if you’re the average man on the street, it’s probably C) something you’ve never heard of. Putting a bit of data behind attitudes to the emergent crypto currency that’s got VCs all excited is a new slice of research conducted by survey firm On Device in conjunction with the organisers of an upcoming London-based Bitcoin conference. The firm surveyed more than 22,000 U.S. consumers in May 2013 to test Bitcoin awareness and levels of trust at this still relatively early stage in its development. Bitcoin went live on the web in 2009, but in currency terms that still makes it a bawling babe. Add in its distinguishing features — being the first decentralised digital currency — plus ongoing teething issues with infrastructure, and political and legal uncertainties, and nascent is the obvious moniker to describe it. Fragile as a house of cards might be another worthy descriptor. But everything has to start somewhere. And Bitcoin has weathered a fair few ups and downs already in its short history. So what do U.S. consumers make of Bitcoin right now? Well, according to the survey, just over a quarter (25.3%) have heard of the crypto currency — which means the U.S. is lagging the other two countries also surveyed for the poll, Argentina and the U.K. In those nations, Bitcoin awareness is apparently in the region of a third, with 37.9% and 32.2% Bitcoin-aware respondents respectively. However it’s worth flagging that the research polled far fewer consumers in Argentina and the U.K. (760 and 2,731, respectively) so the margin of error is likely to be higher. When it comes to trusting Bitcoin, U.S. consumers also lag their Argentinian and British counterparts, but trust levels are still apparently running high among U.S. Bitcoin-aware. The survey found 62% of U.S. consumers who are Bitcoin-aware said they trust the currency, vs 73% of Bitcoin-aware Argentinians and 69% of Bitcoin-aware Brits. Greater awareness of Bitcoin appears to help foster greater levels of trust, as you might expect. Trust in Bitcoin is still relatively low when compared to trust in national currencies. Again, as you would expect. Bitcoin is the upstart in the room, and isn’t backed by any centralised institutions like national banks — which may also, paradoxically, be helping to boost trust in the currency. The global financial crisis has knocked consumer confidence in traditional, centralised economic institutions and governments so a currency that stands outside the control of the establishment may appear more trustworthy to some. Backing up that stick-it-to-The-Man view, the largest group of Argentinian respondents (44%) said the best thing about Bitcoin is ‘not having to deal with financial institutions’. So banks bad, Bitcoin good. Unsurprisingly, Argentinians also come out on top as most likely to trust Bitcoin more than their national currency — but being as their currency has been less stable than the U.S. dollar in recent history, that’s to be expected. The old paper money hasn’t fared well enough to make trying something virtual seem massively risky. The Bitcoin survey found that around a fifth (22%) of Bitcoin-aware Argentinians trust Bitcoin more than their own national currency (while close to half — 48% — rated the two the same). The U.S. was next most trusting of Bitcoin, with 16% trusting Bitcoin more than the dollar. But by far the largest proportion (47%) of U.S. respondents trust it less than the dollar. The U.K. has similarly low levels of Bitcoin trust vs national currency: with 14% trusting Bitcoin more than Sterling and 48% trusting it less. On the question of whether Bitcoin is the currency of the future, the survey found relatively high levels of belief in its future potential across the board. Argentina came out on top — with approaching half (46%) of those polled affirming a key future role for Bitcoin. But U.S. and U.K. respondents were also relatively positive about Bitcoin’s prospects, with more than a third (38%) apiece saying they believe it is the currency of tomorrow. The U.S. does also contain the largest group of Bitcoin naysayers, though — with almost a quarter (24%) of respondents saying they do not think Bitcoin will take up that central future role. What about reasons for liking Bitcoin? In the U.S. and the U.K. the most popular response when asked about the best thing about Bitcoin is that “it’s quick and convenient” — cited by 36% and 43% respectively. Opinions on the worst thing about Bitcoin varied more, with the largest proportion (34%) of respondents from Argentina saying the biggest drawback is “minimal use in trade” — again suggesting that Bitcoin interest there is fuelled by lower levels of trust in a national currency and by a desire to find a replacement for everyday currency, rather than being so fuelled by Bitcoin’s potential as an investment vehicle. In the U.K. the largest single complaint — cited by just under a third (30%) of respondents — was about Bitcoin’s volatile exchange rate, suggesting Bitcoin interest there is being fuelled more by investors than people who actually want to use Bitcoin to buy goods and services. While, in the U.S., the two most commonly stated reasons to dislike Bitcoin (cited by 29% apiece) were ‘minimal use in trade’ and ‘you can’t physically hold a Bitcoin’. The latter suggesting a purely digital currency still has a way to go to get people to place their trust in it. What about the sort of things are people using Bitcoin to buy? 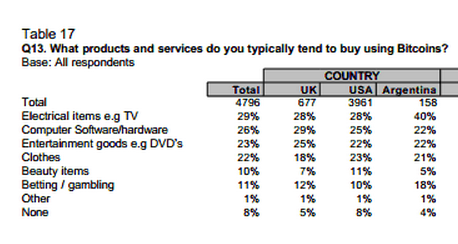 Turns out electrical items are a popular choice, along with computer software/hardware and entertainment goods like DVDs. The majority of respondents in all three countries pegged their annual Bitcoin spending on goods and services as sub-$999, with 74% of Argentinian respondents reporting that level of spending, and 73% apiece in the U.S. and U.K.